Aidan Christopher is on his way on or around March 9th, 2009!!! Yup, we're DEFINITELY having a boy! The appointment went great today. 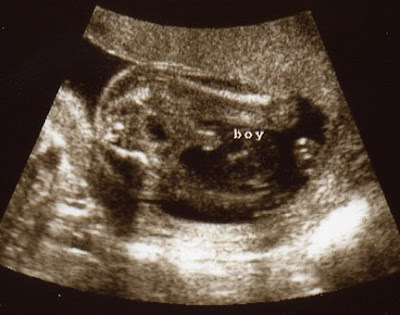 The ultra sound was amazing, he's so cute! And very active!!! Actually, he's been kicking all day today, I think he's as excited as we are! He's measuring right on track and is weighing about 12 oz. right now. And because parent's always embarass their little ones, here's his "manly" proof. Seriously, no mistaking this one! If you look closely at the word "boy", right below the "b" is one of his eyes, the white line is his nose, then his other eye.... I didn't notice until just now that he was peeking down at us! As for me... I'm doing great too. Everything is measuring perfectly on me as well. I have gained a total of 9 lbs., which is great. I was concerned about this past month's weight gain, 3 lbs. Not bad at all. The next appointment is in 4 weeks. 9 lbs. is perfect! You look great. Pregnancy suits you very well. Love the pics of Aidan. Thanks for posting them! Wow! What a beautiful little guy. :) So glad you're feeling well and everything is progressing right on-track. Congrats! yay!!!! soo excited for you! Aidan is too cute! 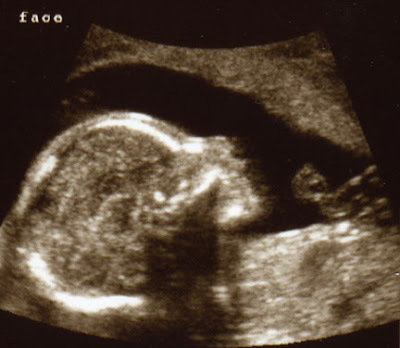 There's something about a ultrasound photos that makes things so exciting! That's fabulous news that you're feeling great too! Congrats! Little boys are wonderful!